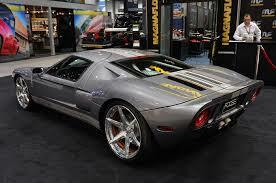 On October 13th, 2013, Chip Foose received his dream car, a 2006 Ford GT, from his beloved wife for his 50th birthday. To nobody’s surprise, Foose wasn’t about to just sit on a stock version of this car. Instead, the hot rod legend amped it up to the next degree. For months, Foose’s excitement for upgrading the GT could not be contained, spilling out regularly in Tweet updates about his ride. Over the months, Foose refined and smoothed out the design. He removed the rear bumper, and he cut back the frame extensions and trimmed them flush with the body. Further adding to the enhanced look, Foose also added custom nerf covers and enhanced the body stripes with an orange 3M vinyl accent. But what about the engine? Being a hot rod legend, we all knew Foose was going to take his ride’s power to the next level. For the project, Foose snagged a helping hand from MagnaFlow to help his 5.4-liter supercharged V8 breathes a bit easier. All of this collaborative hard work to upgrade the vehicle finally paid off yesterday as Foose enjoyed sitting back and watching his ride soak up the praise at SEMA. Without a doubt, it’s been one of the major successes of the event and has served as just another example of why Foose has become synonymous with BEAST out in the hot rod universe. This entry was posted in Autoshows, Culture and tagged Chip Foose, Foose, Ford GT, SEMA. Bookmark the permalink.